Picture - A Heinkel He 50 of a night ground-attack unit on the Eastern Front. The Heinkel He 50 was a German World War II-era dive bomber originally designed for the Imperial Japanese Navy. Serving in Luftwaffe pre-war dive-bombing units, the He 50 served almost until the end of World War II as a night harassment bomber. A prototype, the Heinkel He 50aW, was completed in the summer of 1931. It was a biplane of mixed construction. The aircraft had twin-floats for an undercarriage and was powered by a Junkers L5 inline engine. The engine was found to be underpowered. A second prototype, the He 50aL, was built, which was powered by a Siemens Jupiter VI radial engine and had a wheeled undercarriage. A second He 50aL was built and re-designated He 50b. Based on the He 50b, a third prototype designated Heinkel He 66 was completed for the Japanese Navy, and used as the basis of the Aichi D1A. The He 50 was an equal-span biplane based on a rectangular-section fuselage with a primary structure of welded steel tube construction, faired out to an oval shape by wooden formers and stringers and covered with fabric except in the extreme nose, which was skinned in light alloy. The wings were fabric-covered wooden construction with a marginal stagger and very slight sweep, carrying ailerons on all four panels. The He 50aL was re-designated He 50 V1 and demonstrated to the German Defence Ministry in 1932. This resulted in an order for three development aircraft, and a production batch of 60 He 50A-1 aircraft, which were built during the summer of 1933. China placed an order for 12 He 50As, but modified with an engine cowling added and designated He 66b. These aircraft were commandeered by the Luftwaffe and re-designated He 50B. In 1935, the He 50 was delivered to the Luftwaffe's first dive bomber unit, and later partially equipped nine other dive-bombing units. 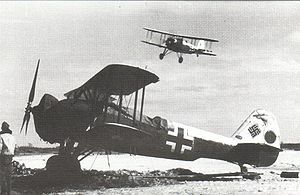 The He 50, however, was steadily replaced by the Henschel Hs 123 and Junkers Ju 87, after which He 50s were transferred to dive bomber training units. In spring 1943, surviving He 50s were rounded up from training schools and delivered to night ground attack units operating on the Eastern Front. The He 50 was used to conduct night harassment sorties on the Eastern Front until September 1944, when the units were disbanded. First prototype as a floatplane, powered by a 291 kW (390 hp) Junkers L5 inline engine, badly damaged in a forced landing. Second prototype as a landplane, powered by a 365 kW (490 hp) Siemens Jupiter VI (Gnome-Rhone/Bristol) radial engine. Third prototype designated HE 66 for export to Japan, three more completed for German evaluation, powered by a 373 kW (600 hp) Bramo 322B radial. Dive bomber, reconnaissance version for the Luftwaffe, 60 aircraft built. Redesignated of the HE 50A, production model, Heinkel produced 25, Bayerische Flugzeugwerke produced 35, powered by a 373 kW (600 hp) Bramo 322B radial. 12 exported to China, powered by a 358 kW (480 hp) Siemens Jupiter VIIF radial. Powered by a Bramo 322B engine, 12 built for export to China, but impressed into Luftwaffe service as HE 50B, later delivered to Hong Kong and remained in storage from January 1936 until July 1937, transferred to Peking for limited service in the 2nd Sino-Japanese War. Some He 66 reconnaissance aircraft were built by Aichi in Japan. Improved version of the Aichi D1A1. Donald, D., ed. Warplanes of the Luftwaffe: Combat Aircraft of Hitler’s Luftwaffe, 1933-1945. London: Aerospace Publishing, 2001. ISBN 1-8805888-10-2. Heinkel He 50 Pictures and Heinkel He 50 for Sale.